Update 19 November 2015: There is increasing evidence that the frequency excursions I saw aren’t actual beacons. See bottom of article for details. Yesterday afternoon, a series of tweets alerted me to a user tracking technique I hadn’t run into before: a company, SilverPush, has been selling technology that embeds “ultrasonic beacons” in TV shows that can be detected by mobile phone apps. The technology would allow the app to determine what TV shows (or perhaps what advertisements) you have been watching, providing additional, perhaps personally-identifiable, information about you to the advertising ecosystem. After a bit of speculation about whether the ultrasonic beacons might annoy dogs (nobody thought it would), I thought it might be worth looking for them. I recorded just over an hour of audio from Cartoon Network; I chose CN because it was the one network featured on the SilverPush website. I did my recording with Audacity, and then exported the audio to Sonic Visualiser for spectral analysis. My initial surprise was the uniformity of the high-frequency cutoff of the audio: almost always, there was a consistent rapid rolloff at 18 kHz (the upper limit of human hearing varies by age, but is in the 15-20 kHz range). But the upper limit during commercial breaks was not consistent: some advertisements had a high frequency cutoff as low as 14.2 kHz; many others were at 15 kHz and others were at 18 kHz like the program itself. This might be accounted for by different source material in some of the ads. 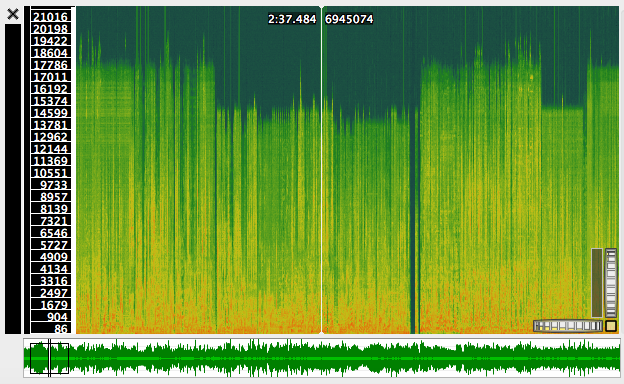 Spectrogram of “party, party, party”. Note high frequency excursions on the first instance. The bigger surprise was the presence of some high frequency content above the usual cutoff frequency. In one particular example, a promo for CN’s Regular Show included a clip where some characters are chanting “party, party, party”. 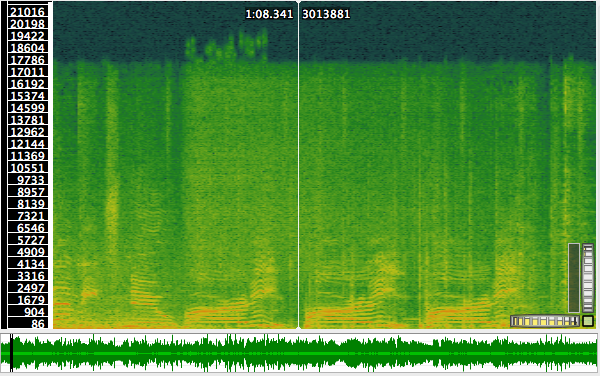 As the spectrogram (see second picture) indicates, the first instance of “party” includes some content above 18 kHz that isn’t there for the other two, although they sound remarkably similar. I haven’t managed to analyze the high frequency content, but this looks like it might be the way the beacons work. This is pretty stealthy for a company that claims to “Increase TV advertising transparency with real-time TV analytics”. And no, the beacons wouldn’t bother your dog. Update (11:40 AM): Katie McInnis of the Center for Democracy and Technology pointed out the patent application for this technology which was listed under another company. It refers to the insertion of frequency-shift keying modulated data at 17.5 and 18.5 kHz. This is close to the right frequency range (except that 17.5 kHz would collide with a lot of the program information), but doesn’t appear to be the encoding used in this sample. Update (19 November 2015): Analysis by several researchers is providing increasing evidence that the nature of the beacons is considerably different from the above, taking the form of much slower (1-2 second) tones in the 18-20 kHz range. This makes a lot of sense; I was having some doubts about the reliability of detection of the short and complex frequency excursions described above. I am not aware of any captures of the beacons on live content, however.